Moms are the work horses of the holiday season. With so much to do this holiday season, plan to enlist a family of volunteers to help get it all done. Sorry, there's just no polite way to say it. We clean. We shop. We clean. We wrap. We clean. We decorate. We clean. We cook. We clean. We entertain. We clean. Enter the elves. No, Santa's not sending down reinforcements. I'm talking about the "volunteers" stationed year-round in your home. It's time to call in the troops to help with the holiday house cleaning. You can make it painless. You just need: 1. To have a plan and 2. to delegate - just a little. Christmas Eve: No matter what your holiday traditions are, some things are constant. Your house will be a mess. You have to eat. You want to wear nice (preferably clean) clothes. You want a fire and music. So as part of your holiday house cleaning plan, you'll want to assign cleaning tasks before the Big Day arrives and let the troops - your little family elves - help do a little of preparation work. Cooking: Well, that's you. Try to work ahead as much as possible. Make your menu, your grocery list, and shop early if possible. Now cook everything you can ahead of time. Make a plan for what goes into the oven when. Cleaning: No sense in doing too much too soon. Especially if you're a messy cook like me and if you have kids. 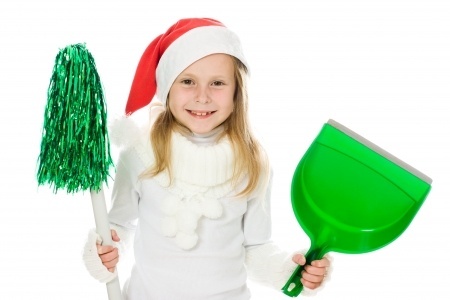 On Christmas Eve day, bright and early, do your last-minute cleaning. Each kid is in charge of her or her own room. Hubby is in charge of baths and your room. Mom better do the living areas. Especially if guests are coming. Laundry: Figure out today what clothes everyone is wearing. Rush special dresses to the cleaners. Make sure everything else is spot free. Put hubby on shoe detail. Trash: Put a kid in charge. Tell him he must make sweeps twice a day or he'll likely get a lump of coal from Santa. And on Christmas morning, that kid is in charge of stationing trash bags in strategic areas where the unwrapping will commence. And he's also in charge of hauling gift boxes out and other trash out after the festivities are over. Tree and holiday plants: If you have a tween or teen, put her in charge of keeping the tree, Christmas plants, and decorative greenery adequately watered. Fire: Hubby. He also gets Christmas music and candle detail. Table setting: Appoint the kids if they're old enough. Make sure holiday table linens are clean and ironed and the silver is polished. Dishes: Try to involve the whole family. One kid can gather up dirty linens. Another can scrape plates and bring dishes to the sink. Another can cart out trash. (We're probably running out of kids here.) Mom of course gets to repackage leftovers and put them them in the fridge. But after the dishes, if you've delegated holiday house cleaning properly, you can retire to the family room, put your feet up and enjoy the holiday ambience.